Dave Challinor is hopeful Fylde's FA Trophy tie will go ahead at the second attempt. 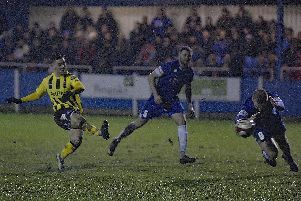 AFC Fylde boss Dave Challinor remains cautiously optimistic that Tuesday's rearranged FA Trophy clash at Ramsbottom United won’t fall foul to the weather for the second time in four days. The Coasters were due to make the trip to Ramsbottom for their last-16 clash on Saturday only for it to be postponed following a failed pitch inspection. The two clubs are confident Tuesday's game will go ahead but Challinor admits there’s always the danger of the pitch becoming waterlogged. “We had a pretty good idea we would be struggling to play the game on Saturday,” he told The Gazette. “The signs look pretty good for Tuesday. The only concern is that when a pitch is so covered in snow, as it was, eventually when it thaws you hope it doesn’t waterlog. Despite the game being moved to midweek, Challinor insists the team he picks will not be much different to the one he would have chosen at the weekend. “The squad pretty much picks itself in terms of where we’re at,” he added. “Anyone who has a slight problem we won’t be risking so we are pretty much at 16, possibly 17 with the young lads included. “New signing Tom Sang will be one of those involved. “That’s one area where we have the luxury of being able to mix things up a little bit with having bodies in there. We’re probably more restricted in defence. We’re also a little restricted in the forward areas, with Dan Bradley and Ash Hemmings cup-tied. “The midfield area is one where we can mix it up and there will be lads who need games who get some time. “The good thing for us that Tom can play in different positions, although his preferred position is as a holding midfield player. 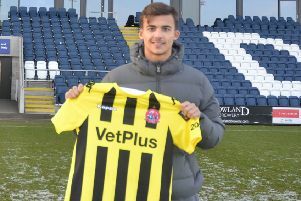 “That’s where he’ll play against Ramsbottom but he does give us flexibility and can do a job in different areas for us. We’ve had him in training and he played in a game last week behind closed doors, where he did really, really well. The winners of the tie will progress to the quarter-final stage where they will host either Barnet or Carshalton Athletic, who drew 3-3 on Saturday. While Fylde avoided the teams including Leyton Orient and Salford City, Challinor’s only priority was to be drawn at Mill Farm in the last eight on February 23. “The only real priority in these draws is to get a home draw, it didn’t matter who we would get,” Challinor admitted. “The draw and what it entails makes no difference if we don’t turn up and win at Ramsbottom, so that’s where our focus is. “If we’re still in it when the next round comes around then we’ll approach that on its merits. “I don’t think it makes much odds who you get to be honest. “The likes of Salford and Leyton Orient, both of them have heavily rotated their squads. “If you asked those two about the competition, they’ve both made changes. “If you look at the Leyton Orient side at the weekend compared to the one that will play in the next league game, I’d imagine there will be five or six changes.